I'm creating a responsive website. I have set up a container element for the form that resizes correctly. Now I just want to insert my form in this element. But I can't get my form to resize according to its parent element. I have tried iframe without success. I think that maybe the injected CSS in my form can cause problems but I have tried setting static values to 100% without success. So my question is: how can I get my form to go all the way to 100% width of the container? Hi, I noticed that you embeded the form ID 21812583257354 on to your container. 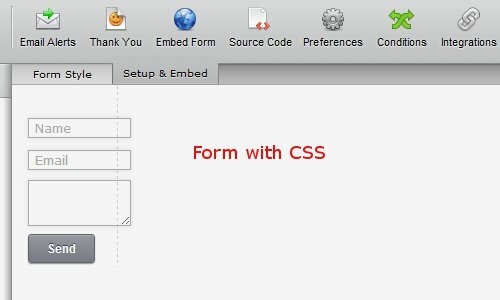 The form that is embeded has CSS code that is causing it to change to it's present look. Try not to limt the form that will be embeded so that it can adjust tot he container. Your form is set to a width of 100px and those values/settings are passed along to the container. I noticed that I had set 100% as "Form Width" in Preferences and I think it may have interpreted that as 100px. I changed that to nothing and I did see some change but it still doesn't go all the way too 100% of the parent width. Can you please insert this piece of code into your custom css code ? I tried inserting it in my own style.css as well as injecting it as "Custom CSS", neither did anything. Just updated my codes. Kindly recheck. Thanks! It seems to be working now!